Thanks to Drs. 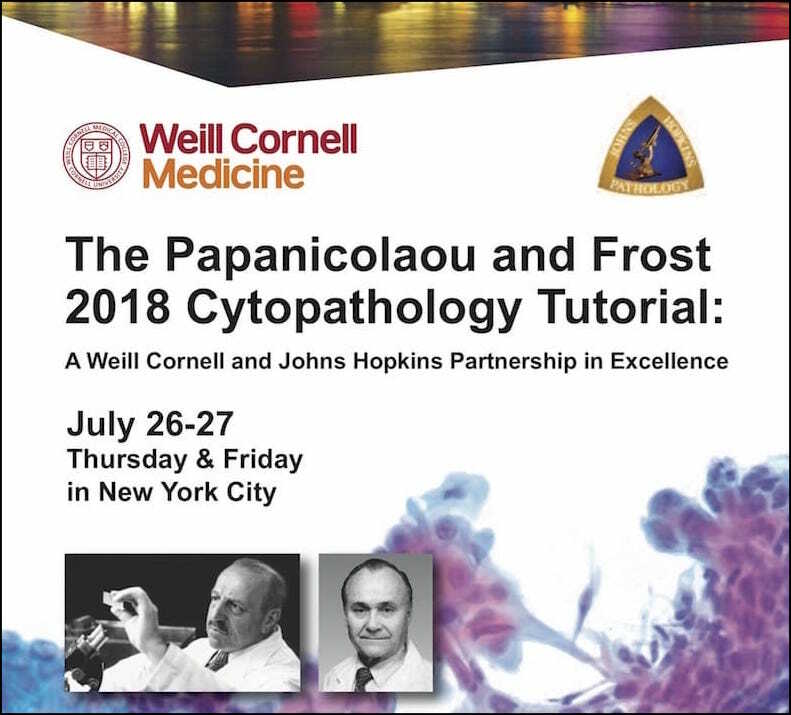 Arno Vanstapel and Raf Sciot, KU Leuven (Belgium) for contributing this case and Dr. Raul S. Gonzalez, University of Rochester Medical Center, Rochester, NY (USA) for writing the discussion. To contribute a Case of the Week, first make sure that we are currently accepting cases, then follow the guidelines on our main Case of the Week page. (1) We are looking for great writers to help update our free online textbook. By becoming an author, you gain an international exposure (29,000 average visits per day from 100+ countries) and have publications you can add to the book chapter section of your CV. PathologyOutlines has a national and international presence ​with metrics that can be reported in promotion and tenure dossiers. Please review our author information page at http://www.pathologyoutlines.com/Instructionsforauthors.html, and email your CV to erinthomas3161@gmail.com with your areas of expertise/interest. (2) Please add CommentsPathout@gmail.com to your safelist / address book, so your subscriptions to our emails go directly into your inbox. (3) Go to our Facebook page to see pictures of visitors to our booth at the annual USCAP meeting and the fellowship fair. 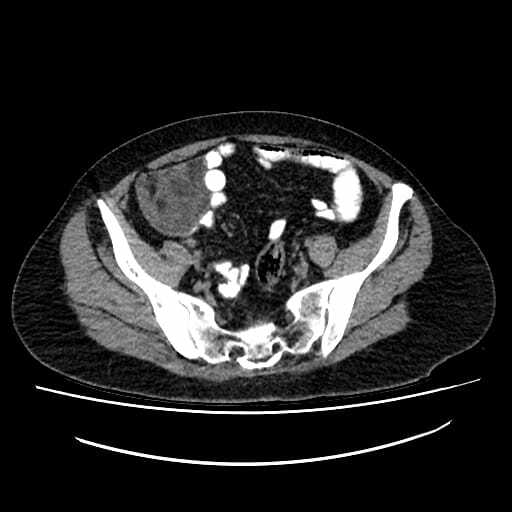 A 51 year old woman presented with a nagging pain in the right iliac fossa region for a few weeks, but had no other complaints. 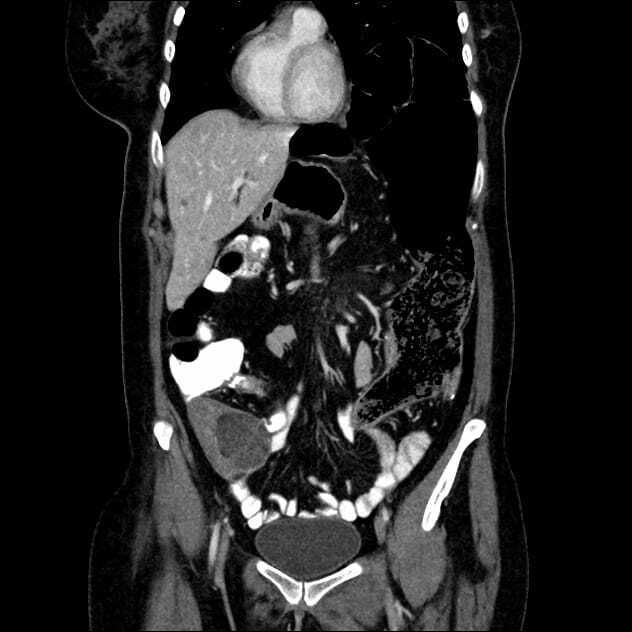 Abdominal Xray and CT with contrast revealed an extraluminal mass in the right iliac fossa, suggestive of a distal ileum gastrointestinal stromal tumor. At resection, the tumor was attached to the abdominal wall, well delineated and without adhesions to other abdominal structures. The peritoneum surrounding the lesion was completely intact. The surgeon found the lesion suspicious for a liposarcoma. Macroscopic evaluation demonstrated a lesion with a smooth surface and a partially hemorrhagic content, measuring 8.5 x 6.5 x 6 cm with a total weight of 160 grams. Which of the following immunohistochemical stains would help distinguish retroperitoneal myolipoma from a well differentiated liposarcoma invading smooth muscle? Myolipoma is a rare benign soft tissue tumor that can arise anywhere in the body, although the retroperitoneum is often its site of origin (Am J Surg Pathol 1991;15:121). Most patients are female. 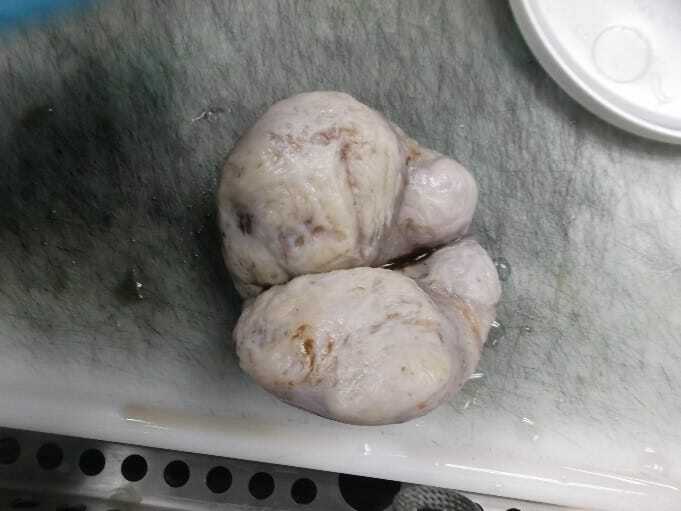 Grossly, myolipoma is typically somewhat large (average size 16 cm in the original series), with white-yellow fatty components and gray-white muscle components. Microscopically, the tumor is composed of intermingled adipose tissue and short fascicles of smooth muscle, at least partly surrounded by a capsule. Sclerosis and inflammation may be seen, although atypia and mitotic figures should be absent. As the lesion does not recur or metastasize, surgery is curative. Immunohistochemistry for smooth muscle actin highlights the muscle elements, and progesterone receptor is sometimes positive. Recently, HMGA2 gene alteration has been reported in myolipoma, and HMGA2 immunohistochemistry appears to be positive in most cases (Am J Surg Pathol 2017;41:153). The main differential diagnosis, especially in the abdomen/retroperitoneum, is well differentiated liposarcoma. That lesion also contains bland appearing fat, although careful inspection reveals lipoblasts. Other elements may be present, including muscle. The diagnosis can be confirmed via FISH to identify MDM2 (12q15) amplification (Mod Pathol 2009;22:66). Immunohistochemistry for MDM2, CDK4, and p16 may be somewhat useful, but FISH remains the preferred diagnostic modality (Am J Surg Pathol 2012;36:462). Dedifferentiated liposarcoma with myosarcomatous elements can be identified by obvious nuclear atypia (Histopathology 1994;25:86). If a tumor resembles myolipoma but also has prominent thick walled vessels, angiomyolipoma should be considered. These tumors often arise in or around the kidney, and they are positive for HMB45. Other mesenchymal tumors can arise in the abdomen/retroperitoneum and can mimic myolipoma clinically, although the histologic features are different. Gastrointestinal stromal tumor usually arises from a gastrointestinal organ, is diffusely composed of spindled or epithelioid lesional cells, and is strikingly positive for cKit and DOG1 by immunohistochemistry. Desmoid fibromatosis is very poorly circumscribed, shows long fascicles of bland mesenchymal cells with long, thin vasculature, and has nuclear beta-catenin immunostaining. Schwannoma has thick walled vasculature, variably dense and sparse cellularity (Antoni A and B areas), and may be surrounded by chronic inflammation; S100 immunohistochemistry is positive in the mesenchymal cells, and abdominal schwannomas may also be keratin positive (Mod Pathol 2006;19:115). Abdominal leiomyoma is well circumscribed, intensely eosinophilic on microscopy, and does not contain fat. 1. 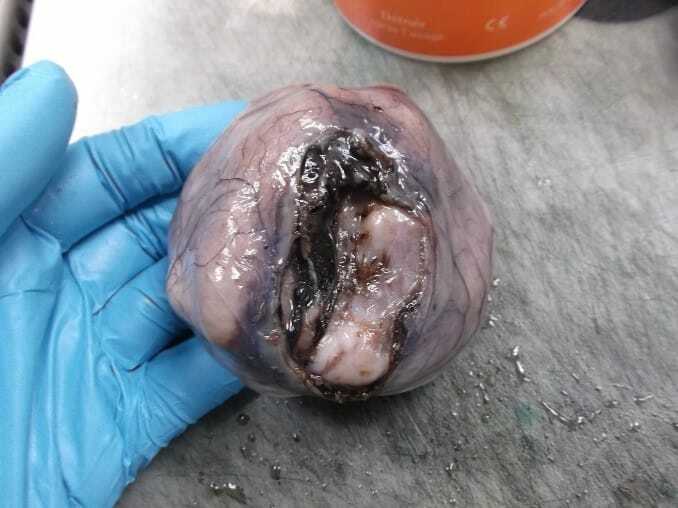 A similar appearing tumor in the uterus is termed lipoleiomyoma. 2. Myolipoma should not be confused with myelolipoma, which is a benign tumor composed of fat and hematopoietic elements; it most commonly occurs in the adrenal gland.